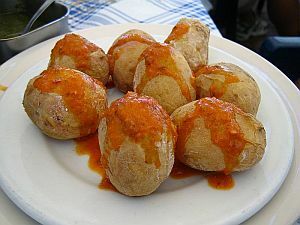 Papas arrugadas (also known as "Canarian potatoes") is considered the signature dish of the Canary Islands. Even inhabitants of mainland Spain find these a novelty when visiting the Canaries. Something similar is found in New York State, where they are known as "salt potatoes". They can be served as a tapa or as an accompaniment for a main course. It is necessary to use the smallest potato possible. New or salad potatoes are fine for this. 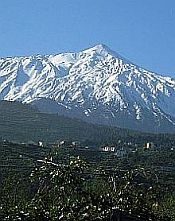 Canarian chefs use a variety called papa bonita which remains small even when fully grown. There is little more to say about this dish, except, When prepared correctly, it is delicious. They are best experienced smothered in the spicy red mojo sauce. Wash potatoes, removing any dirt and "eyes". Place in a pot and add sufficient water to just cover them. Add a large amount of sea salt. It is possible to add too little salt, but impossible to add too much. Boil the potatoes for up to 20 minutes, to cook them. Pour off any excess water, then return them to the heat. As any remaining excess water evaporates, the potatoes will become wrinkly and a layer of salt will adhere to them.